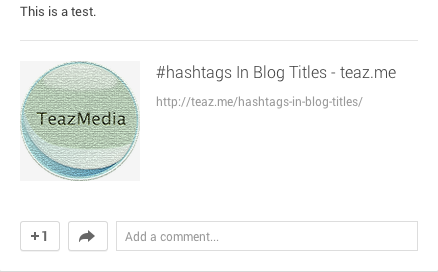 Should I Include Hashtags In My Blog Title? This is mostly a test to see what happens when this post is shared on social media. Remember a hashtag is simply a hash/pound symbol preceding a word that is often hyperlinked by a platform so that it’s easier for someone to click it and see other posts (yours and others) that use the same hashtag. 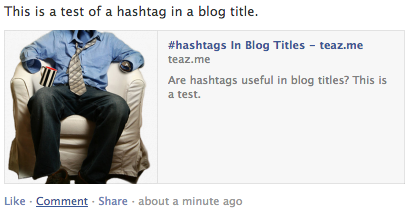 Are there benefits from including a hashtag in a blog post title or does it just clutter things up? 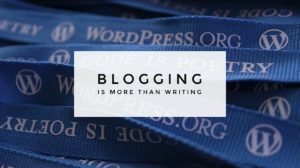 The blog title is usually already a link. Maybe I’m missing something, but let’s see how this post is handled when shared. Here’s my post shared to Google+. Here’s my post shared to Facebook. Here’s my post shared to Twitter. So it’s interesting that my blog title includes the hash symbol on Google+ and Facebook when shared but is removed from the generated link on Twitter. Since the entire title of the post becomes a hyperlink, is there really any advantage for including the hashtag in the blog title? Maybe it’s beneficial if you’re trying to inform readers of a particular hashtag that your post is about. On the usability side, it really doesn’t seem to accomplish what the hashtag is intended to do on social platforms – linking conversations together. Hyperlinking a hashtag within a blog post to a social media platform’s search results is probably better. Maybe I’m missing something and someone else can share with me any advantages they’ve seen by including a hashtag in a blog post title. Just my 2 cents of quick testing over a cup of tea.